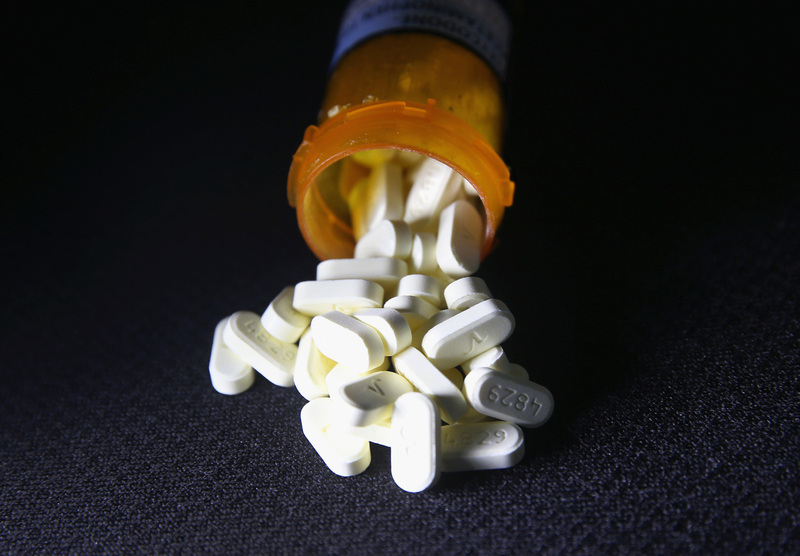 Life Expectancy Drops As Opioid Deaths Surge : Shots - Health News The opioid epidemic caused U.S. life expectancy to fall for the second year in a row, marking the first time that has happened since the early 1960s. Death rates also continued to rise. Life expectancy in the U.S. has fallen for the second straight year, in part because of the surge of overdoses on opioids, such as oxycodone. The trend is especially concerning because life expectancy is considered an important indicator of the general well-being of a nation. "It gives you sort of an overall sense of what's going on," Anderson says. Life expectancy, which is the average time someone is expected to live, generally has been rising steadily for decades in the United States, with only occasional downward ticks. The last time the U.S. life expectancy dropped was in 1993 because of the AIDS epidemic. Life expectancy hasn't fallen two years in a row in the U.S. since the early 1960s. "This is quite concerning," Anderson says. According to the latest analysis, U.S. life expectancy fell from 78.7 in 2015 to 78.6 in 2016. That follows a drop from 78.9 in 2014 that researchers hoped would be an aberration. "For any individual, that's not a whole lot. But when you're talking about it in terms of a population, you're talking about a significant number of potential lives that aren't being lived," Anderson says. Many factors are probably playing a role, including an apparent plateau in the reduction of deaths from heart disease, Anderson says. But a significant factor is the upswing in deaths from opioid overdoses. Tens of thousands of Americans have died from opioid overdoses in recent years. A report released Thursday found drug overdoses jumped significantly in 2016 to more than 63,600, and more than 42,200 of them were attributed to opioids. In 2015, more than 52,400 deaths were attributed to overdoses, and 33,000 of them involved opioids. The rate of drug overdose deaths involving synthetic opioids also jumped significantly, from 3.1 per 100,000 in 2015 and 6.2 per 100,000 in 2016. "It's just really dramatically increased," Anderson says, noting the latest increase is "far and above greater than any of the one-year increases that we've seen to this point." The upsurge suggests the epidemic "appears to be accelerating," he says. "I was pretty shocked to see that our life expectancy has declined for the second year in a row," says Arun Hendi, a demographic and sociologist at the University of Southern California. "I think we should be very worried." Hendi says the nation "urgently" needs to cut off the supply of drugs flooding the market, "particularly heroin and fentanyl." The U.S. also needs to increase the availability of treatment for addicted Americans and improve access to high-quality health care, he says. Some researchers studying mortality trends say the opioid epidemic is just part of a larger problem. "It's also a crisis in which people are killing themselves in much larger numbers — whites especially," says Anne Case, an economist at Princeton University who has been studying what she and her husband and fellow Princeton economist Angus Deaton call "Deaths of Despair." "Deaths from alcohol have been rising as well. So we think of it all being signs that something is really wrong and whatever it is that's really wrong is happening nationwide," Case says. The decline of well-paying jobs with significant yearly salary increases, job security and good benefits may be fueling a sense of frustration and hopelessness, Case says. That may be one reason fewer people are getting married and more people are having children outside of marriages, Case says. "They don't have a good job. They don't have a marriage that supports them. They may have children that they do or don't see," Case says. "They have a much more fragile existence than they would have had a generation ago." As a result, "it may be the deaths from drugs, from suicide, from alcohol are related to the fact that people don't have the stability and a hope for the future that they might have had in the past," Case says. Other ethnic groups also appear to be suffering from the same issues, too, including African-Americans. "Rates of mortality for Africans-Americans have risen after a fairly long period of decline, and that is concerning and disturbing and it may reflect a wider array of harms arising from drug issues," says Jonathan Skinner, a professor of economics at Dartmouth College.